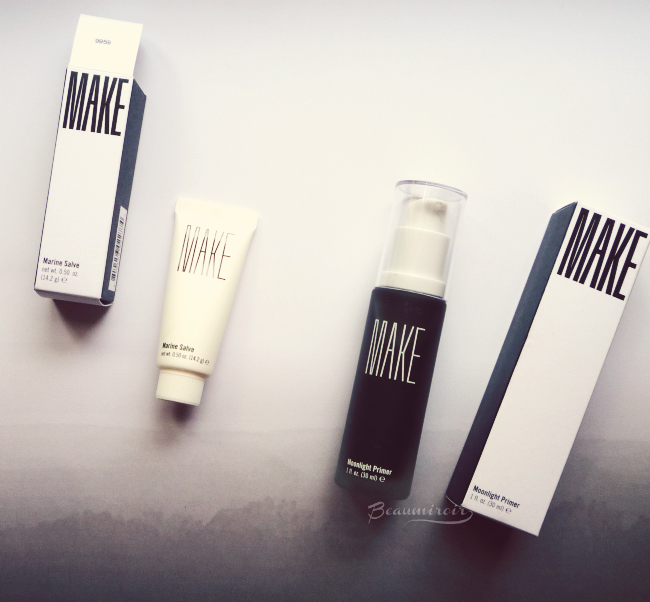 I already told you about New York City based brand MAKE Beauty a while ago, and I'm back with more! I'm really attracted to the edgy, artsy visual identity of the brand and the two products I'm reviewing today are perfect representations of its aesthetic. Let's take a trip from the dark side of the moon to a sun-bleached white beach with the Moonlight Primer and the Marine Salve! Now that has to be the classiest primer bottle I've ever seen! Minimalist, made of thick frosted glass with a white pump and a transparent cap, it contains a surprising.... black primer. This face primer is unlike anything else I've tried before, not just because of its unexpected black hue: it's also formulated to protect skin against the rays emitted by modern tech, our phones, computers and tablets. I've done a bit of research and I haven't found much reliable information about the potential dangers of High Energy Visible light or Infrared light on skin. Some present them as the new evil, worst than UVs, but they don't cite any scientific sources. More credible resources admit that their effects have not been rigorously studied yet. Whether you're concerned with the light from your favorite electronic toy aging your skin or not, the plant-based antioxidant cocktail this primer contains is likely to benefit your skin anyway. Here's the full ingredients list: Water (Aqua), Glycerin, Behentrimonium Chloride, Cetearyl Alcohol, Melanin, Polygonum Aviculare Extract, Undaria Pinnatifida Extract, Cichorium Intybus (Chicory) Root Extract, Polyquaternium-37, Silica, Hexylene Glycol, Caprylyl Glycol, Pentylene Glycol, Potassium Sorbate, Sodium Benzoate, Ethylhexylglycerin, Phenoxyethanol. As you can see there are no silicones, parabens or fragrances. 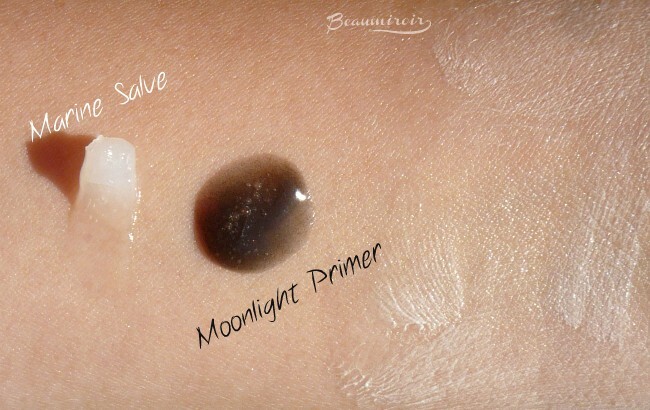 Right out of the bottle the Moonlight Primer is a black gel. How cool is that? Don't worry about giving your skin a gray tint though, it becomes transparent as you spread it. It feels lightweight but nicely hydrating. 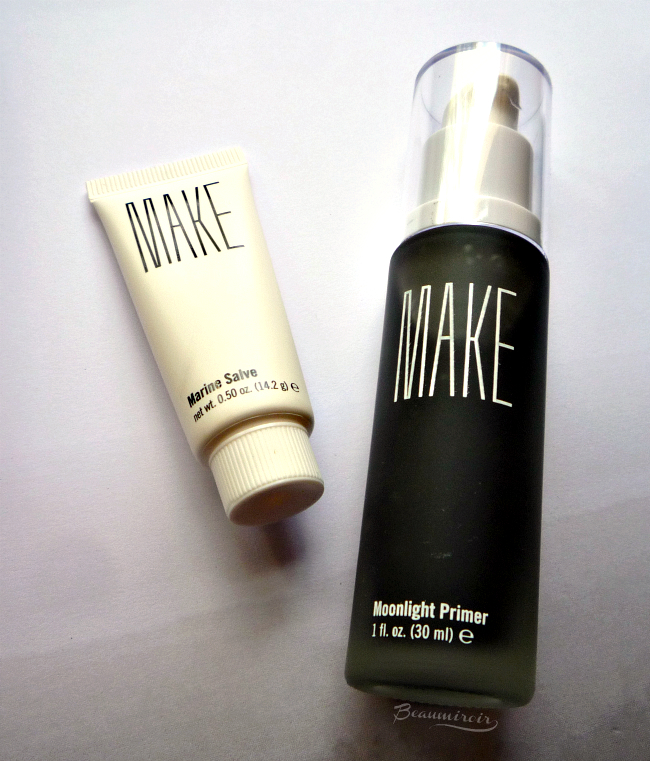 MAKE suggests using it right after cleansing, and I do think it would be enough to replace a moisturizer for oily skin. It leaves my skin very soft and smooth, ready for flawless makeup application. I did notice however that it didn't work well on top of a silicone-based sunscreen that I have: it caused it to pill and roll off my skin. It's best applied on bare skin or on top of a light gel moisturizer. 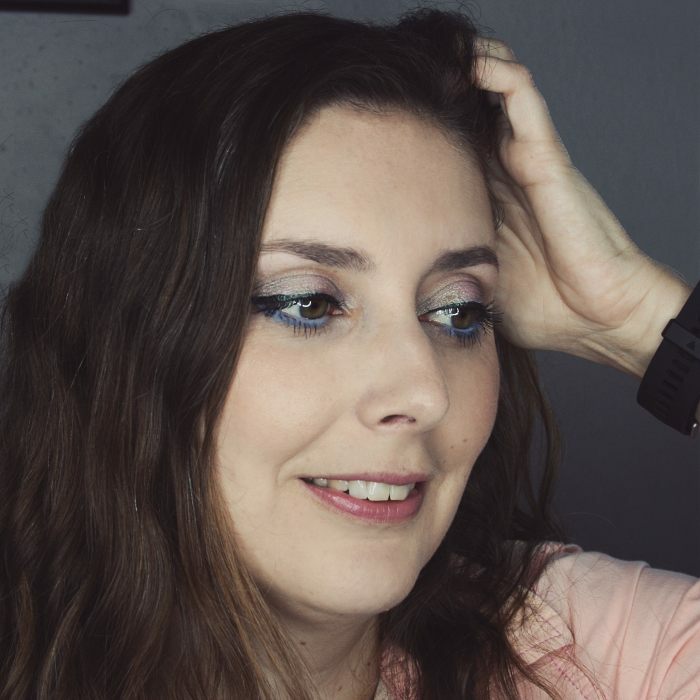 In the current San Diego summer heat, I didn't feel like it really prolonged the wear of my foundation overall, but I had less fading and creasing on my chin and around my nose. This little white tube contains a rich yet lightweight balm that comforts and nourishes dry or damaged skin. Although it is petrolatum based it also contains a good amount of plant oils to deeply protect and repair skin, such as shea , cocoa, olive, jojoba and grape seed, as well as beeswax. Again it's fragrance free and includes neither parabens nor silicones. Here's the full ingredients list: Petrolatum, Hydrogenated Polyisobutene, Butyrospermum Parkii (Shea) Butter, Theobroma Cacao Seed Butter, Olea Europaea (Olive) Fruit Oil, Beeswax (Cera Alba), Simmondsia Chinensis (Jojoba) Seed Oil, Vitis Vinifera (Grape) Seed Oil, Squalane, Undaria Pinnatifida Extract, Tocopheryl Acetate, Citric Acid, Water (Aqua), Sodium Benzoate, Potassium Sorbate. It's a very soothing ointment and, considering the heavy butter/oil contents, the texture is rather thin and sinks into the skin pretty well. Right now I'm mostly using it on my lips as a nourishing balm and primer, but I can see myself applying it to dry patches on my skin or to my hands in the winter. Basically it heals any area that's dry or irritated, and it does it really well. 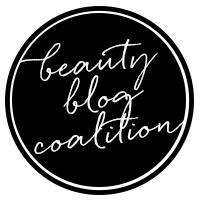 At MAKE Beauty's website. 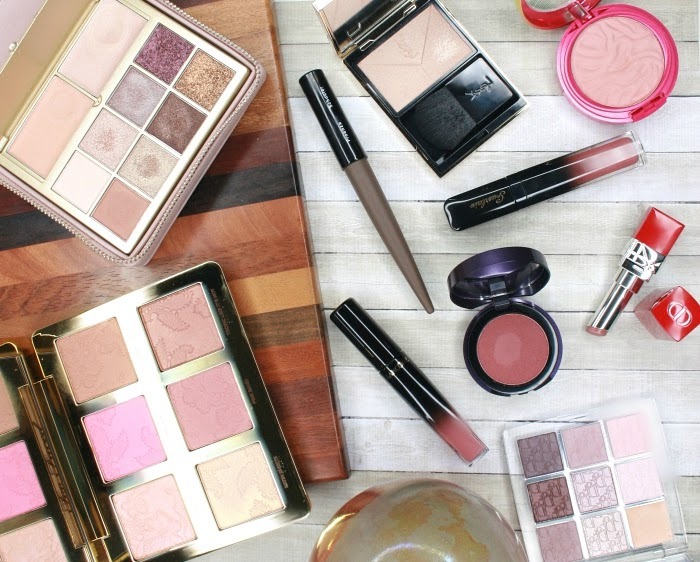 Good to know: all products by the brand are made in the USA, cruelty-free, and 10% of sales are donated to the We See Beauty Foundation that supports women-led, worker-owned cooperative businesses. The products featured in this post were sent by PR for consideration. I received no compensation to write this post, which only reflects my personal opinion. This post contains affiliate links.